Investors looking for high-yield dividend stocks have previously eschewed the tech sector, as that's traditionally been a place to invest for growth. Instead of paying out extra cash to investors, tech high-fliers typically reinvest cash in research and development, mergers and acquisitions, and other classic "growth" strategies. That's why their earnings – and share prices – grow faster than average. 3D Systems Corp. (NYSE: DDD) is the perfect example. Money Morning Defense & Tech Specialist Michael A. Robinson recently called it "the ultimate growth stock." 3D Systems started an aggressive acquisitions program in 2007 to gain engineers, software, and other material needs. DDD has acquired more than 40 companies since 2011. It has also more than tripled its R&D spending per quarter since 2012 – compare $4.933 million spent in Q1 2012 to $17.24 million spent in Q1 2014. The company's earnings reflect the payoff – on February 28, DDD announced full-year revenue growth of 45% for 2013 to a record-high $513.4 million. And 3D Systems stock has skyrocketed – DDD gained more than 850% in two years, jumping from around $10 per share at the start of 2012 to $96 per share at the end of 2013. But, like a classic searing-hot tech stock, DDD has never paid a dividend. That's why investors looking for high-yield dividend stocks go to sectors like utilities and consumer staples. These companies have matured. Their growth phases are over, so they use their strong cash flows to pay dividends. This attracts investors even if the stock has low share-price growth. Procter & Gamble (NYSE: PG), for example, has increased its dividend for 57 straight years and offers a yield of 3.23%. But a few years ago, things started to change. Now companies like this also exist in the tech sector. In fact, some of the biggest names in tech have become high-yield dividend stocks that rival traditional dividend payers in yield and market performance. As tech companies mature and transition from their growth phase into a more stable period, they usually find themselves with more cash than they know what to do with. That's why a couple of years ago, tech dividend payouts picked up the pace. They jumped about 14% in 2012 – compared to the previous years' increases of about 10%. According to the online investing resource Investopedia, over the past 10 years tech has increased its average dividend payments by 25%. That's about 10% higher than the second-biggest dividend payer, consumer services. Now Apple Inc. (Nasdaq: AAPL) is the largest dividend payer in the Standard & Poor's 500 Index. It paid out more than $10 billion in dividends in 2013. Another reason to turn to tech for yield is, not only do these dividend payers provide income, but they also have outperformed market downturns. Many have shown sustained growth even in volatile markets. For instance, the Nasdaq Composite plummeted 8.22% between March 5 and April 11 this year. 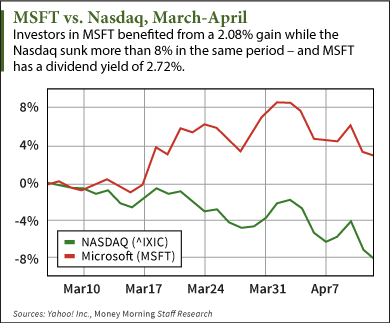 In the same time period, tech giant Microsoft Corp. (Nasdaq: MSFT) – which pays a quarterly dividend of $0.28 per share – gained 2.08%. Now, here's a look at five high-yield dividend stocks in the tech sector.